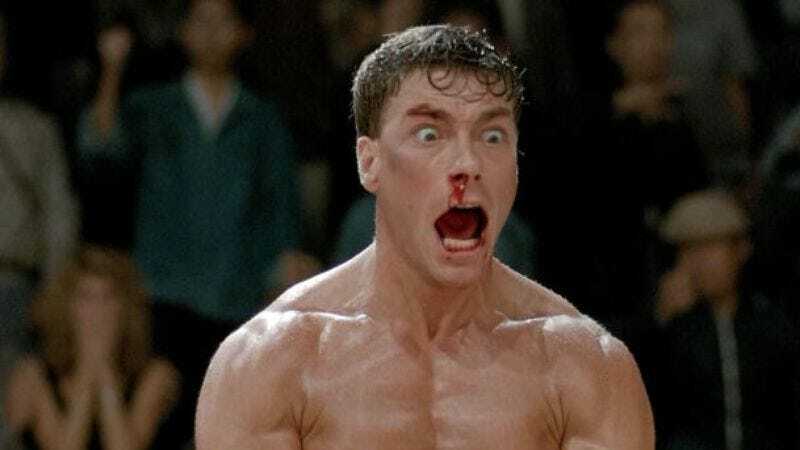 After two years of delays, plans are again underway to remake Bloodsport, the favorite Jean-Claude Van Damme movie among 100-percent of Jean-Claude Van Dammes surveyed (with a margin of +/- Timecop). The project, originally developed by Salt director Phillip Noyce in 2011, is now being helmed by V For Vendetta director James McTeigue, whose work on 2009’s Ninja Assassin confirmed he is familiar with the basic concept of martial-arts-punching someone and then blood goes everywhere. All he needs now is to add a proper English gentleman looking on and going, “Bloody sporting, ol’ chap! From henceforth we shall call you Lord Bloodsport!” like in the original Bloodsport. Unlike the original Bloodsport, however, is everything else: Variety reports that, rather than concerning an AWOL soldier competing for honor in Hong Kong, the film will “explore the life of 21st century mercenaries as they collide with the underground world of Brazilian Vale Tudo fighting.” Also, Jean-Claude Van Damme won’t be involved, which are two major things that will not be at all like Bloodsport, despite still being called Bloodsport. However, these mercenaries will still finish fighting and then retire to a nice colonial in the quiet, New England harbor town of Bloodsport, so that’s the same.